Our visualisations use a classic mapping technique, contour plots, to explore the texture of life and death of billions of people from more than forty countries. 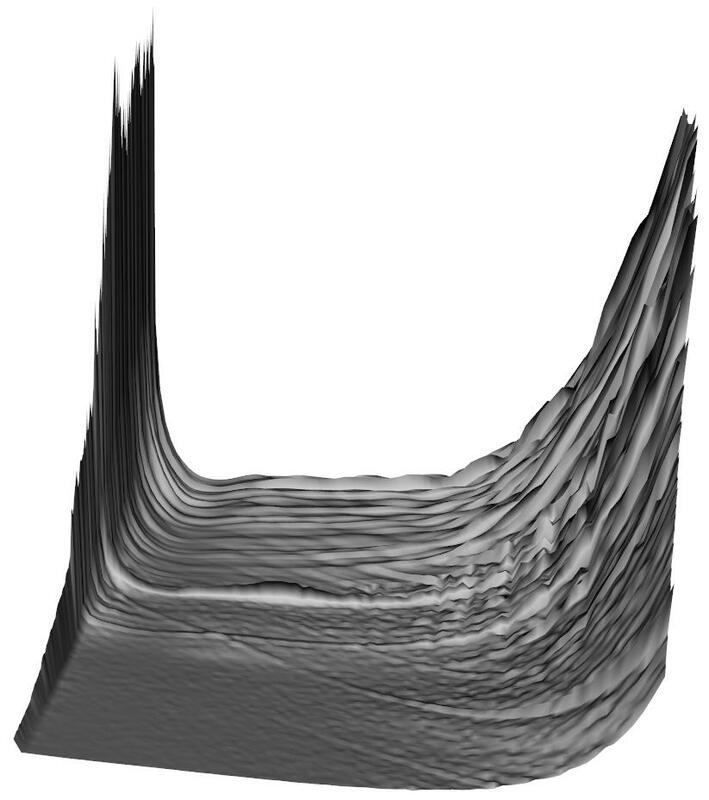 Contour plots show three dimensional structure on a two dimensional page, using nothing but a series of lines. The lines show where, over two dimensions, the values of a third dimension are equal. A classic application in physical geography is showing how height above sea level varies as people travel east or west, or north or south. Travel alongside a contour line and your journey will be flat; travel through many contour lines packed close together, and you will either be climbing or abseiling. We used contour maps to show how a third variable, mortality rates, varied against two others: age and time. Instead of the horizontal axis showing west to east, it shows year, earliest to most recent; and instead of the vertical axis showing south to north, it shows age, ranging from newborns to 80 year olds. Just as the coordinates of physical terrain are latitude and longitude, so the coordinates of mortality terrain are age and year, or age-time. Within these maps, our trajectory as individuals is always along the diagonal: we age one year per year. As researchers, however, we can imagine walking along age-time in any direction, or even flying over it in a helicopter. Our contour plots present a high resolution description of these abstract terrains. What’s the value of doing this? Demographers are typically interested in three kinds of mortality effect: age effects, period effects, and cohort effects. In our maps, we can explore age effects by looking south to north, period effects by looking west to east, and cohort effects by looking across diagonals. We can also see how these age effects have changed with time, and imagine how the terrain would have extended into the past and may extend into the future. We can compare the records of different nations, exploring how demographic changes may have occurred sooner or later, or faster or slower, in some nations than others. The picture is mixed and complex, but not ambiguous. It shows that, as people interested in public health, and as people who care about people, we have much to be proud of. Within England and Wales, and almost every other nation we looked at, we saw two changes to the demographic landscape which made it less hazardous for everyone. These two changes are two good news stories that deserve to be told, and they are both to do with bathtubs. The diagonal tracts of age-specific mortality risk that we travel along as we age used to be ‘bathtub shaped’: very high in infancy, low throughout the rest of childhood and into middle age, and then rising exponentially as middle age becomes old age. The first piece of good news: we broke the left side of the bathtub! Figure 1: Three-dimensional visualisation of the ‘bathtub’, based on female mortality patterns using data from England & Wales. Infant mortality on the left; elderly mortality on the right. Infant mortality changed from an everyday tragedy to something much rarer. At the start of the twentieth century, about one child in four was expected not to reach its fifth birthday. By the middle of the century, this had dropped to around one-in-thirty, and by the end of the century it dropped further, to around one-in-a hundred and fifty. This marked the end of the large family, as parents no longer needed to have many children to protect against the risk of none living to adulthood and passing on the family legacy. With fewer mouths to feed at home, opportunities for women at work opened up, and the march towards gender equality took apace. With far fewer babies to bury, a source of great human misery stops being as numbingly commonplace. The second piece of good news: we’ve been steadily flattening the right side of the bathtub for decades. We can see this by travelling flat, along a contour line marked 0.01, which represents a one-in-one hundred risk of dying in the next year. Imagine this as a hurdle people have to clear in order to keep travelling towards older age. At the start of the twentieth century, men faced this hurdle when they were in their late thirties, and women when they were in their early forties. By the time the twentieth century came to an end, this hurdle has been pushed back almost a generation, to the late fifties for men, and the mid-sixties for women. This is just one of many contour lines which have been pushed back during the Twentieth century. Even better news: so far the contours are continuing to recede into ever older ages, with no signs of stopping. Note: Cell shadings indicate the mortality rates using the colour scheme shown in the legend on the right, with values indicating the risk of dying in the next 12 months. Contour lines are added showing each time the risk of dying changes by 0.005 (i.e. at risks of death of 0.000, 0.005, 0.010, 0.015 and so on, up to 0.200).